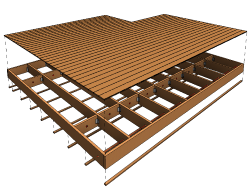 Wood Framing SIPS makes wood framing with structural insulated panels – prefabricated building components for use as walls, floors and roofs – fast and easy with real-time, full-project updates in Revit®. Plus the software generates views with automatic dimensions for panels or segments as well as accurate bills of materials and shop drawings. So quality production and accurate assembly on site are ensured. 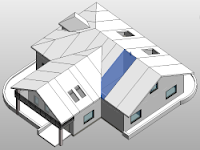 For a roof of any architectural shape, the software instantly splits a selected side or the entire roof by faces (slopes). Likewise, an entire floor can be split according to its supporting structure. 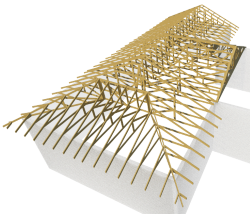 Connectors, cuts, supports and other details can be distributed based on predefined rules or connection types and can then be modified or updated to suit the project design stage and the level of detail required. The insulated foam core between rigid board sheathing (of which SIPs are composed) are created as parts in Revit®. All frames with SIP parts and the layout of frame elements and details can be modified and updated whenever the project is changed. Dynamic update functionality can make changes to all frames with SIPs of the same type at once. Wall, floor and roof frame elements in the project can easily be marked based on their properties and locations in the layer. 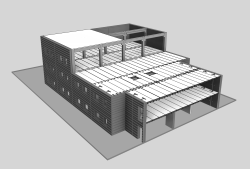 And information for fabrication can be automatically generated with all desired views, schedules and drawings for each wall, floor and roof panel. A powerful solution for prefabricated roof panels in Revit®. 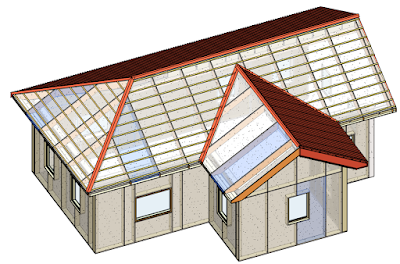 It enables easy roof panel planning and splitting into segments for prefabrication which can then be used in the roof framing process. 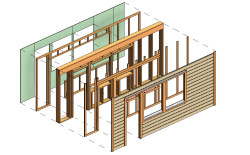 Wood Framing SIPS is brought to you by AGACAD. Pricing was not known at press time.